Stella and Dot Chic 'n Gorgeous ePARTY! In 1998 Renee Trikolas launched Isabella Rose Designs, a chic jewelry company named after her daughter. A few years ago, Renee's marriage was ending and so was her motivation to continue designing, or frankly to do much of anything. Last Fall Renee picked herself up and relaunched Isabella Rose Designs in an effort to rebuild her life. 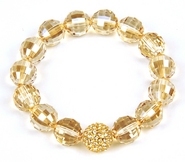 Today the company sells exquisite bracelets made from sparkling swarovski crystals, sterling silver and 24 KT Gold. Renee hopes her story empowers and is an inspiration to other women. The Queen of Arm Candy, as Renee is known, graciously sent us two bracelets, one for us and one for a lucky reader. As soon as I opened the box I could see the love that went into creating this treasure. Swarovski crystals, hematite and sterling silver balinese beads are handstrung on durable elastic. This is a dainty feminine bracelet that is available in three sizes. We were sent the 7" and it fit fine around my wrist. It is perfect for those with small wrists who have a hard time finding bracelets that fit. It is also available in 7.5 and 8". The elastic makes it so easy to put on and take off, no fussing with clasps or risk of losing it because the clasp came undone. It has a bit of sparkle to it and a nice weight. It has the sweetest little heart charm which bears the company's name. Wear alone or stack for a more dramatic look. Vivienne retails for $102. The focal point of this translucent golden-champagne beaded bracelet is the eye-catching shimmering studded pave crystal ball. It adds a bit of sophistication to an outfit. Brit is also available in silver and in three sizes. It retails for $83. Find these and many other beautiful designs at IsabellaRoseDesigns.com and be sure to follow Renee on Twitter and Facebook for new products, events and special incentives. It was difficult choosing the bracelet with which we were going to part. I absolutely love the pave bead on Brit. I have a thing for hearts though and the Vivienne with it's adorably chic petite silver heart put it over the top for me. 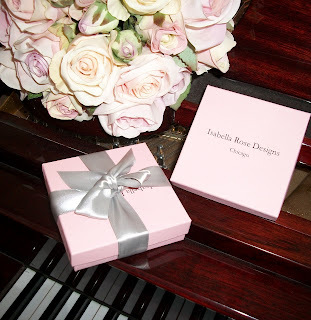 ~♥~ Soooo we will be sending a lucky reader the Brit bracelet courtesy of Isabella Rose Designs. Contest ends 11:59 PM March 16, 2012. Please visit our Chic Giveaways page for Complete Rules and additional Gifting Events. I really like the Roxy! The red and gold is so exotic looking! I like Diamante. Very pretty! 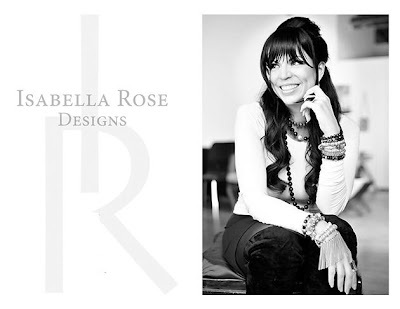 I'm following Isabella Rose Designs on Facebook and left a comment on her wall about her fabulous style! The Monroe is my favorite bracelet! I like the Candice Bracelet so pretty. My favorite is the Octavia. I also love the Adriana bracelet. I like Chic Luxuries on Facebook! I like Isabella Rose Designs on Facebook! I love the Julia bracelet with Amethyst or Peridot beads. Adrianna bracelet. Although I love them all!! Like Chic Luxuries on facebook. I like the Julia 2.o. I LOVE Coco! SO PRETTY! I also love the Harper bracelet from the Spring 2012 collection! Oh was it hard to choose a favorite! I finally narrowed it down to loving the Monroe the most. They are all beautiful. I really lover her full line, but I adore the Tatum & Tilly. Oh wow! It was so hard to choose just one! I follow Isabella Rose Designs on Facebook & left a little love on the page. I like the Jenna bracelet. Amelia is my favorite bracelet. I liked both Facebook pages, Tiffany Vanick. I followed both twitter acounts, @mermaidmocha. I like the Priscilla bracelet. I love the Roxy bracelet. Following Isabella Rose Designs on Facebook and left a comment. Liked Chic Luxuries on Facebook. I love the ELLE bracelet! ELLE BRACELET is a winner.